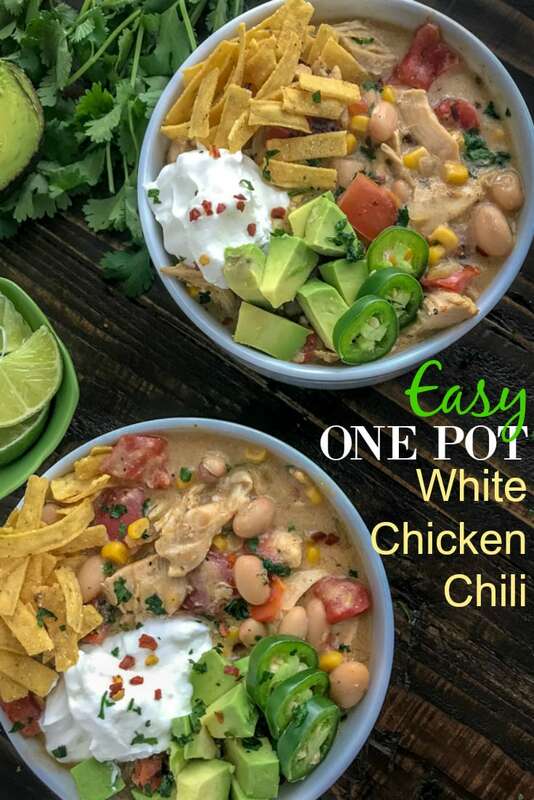 Easy One Pot White Chicken Chili – a traditional family favorite, but lightened up! 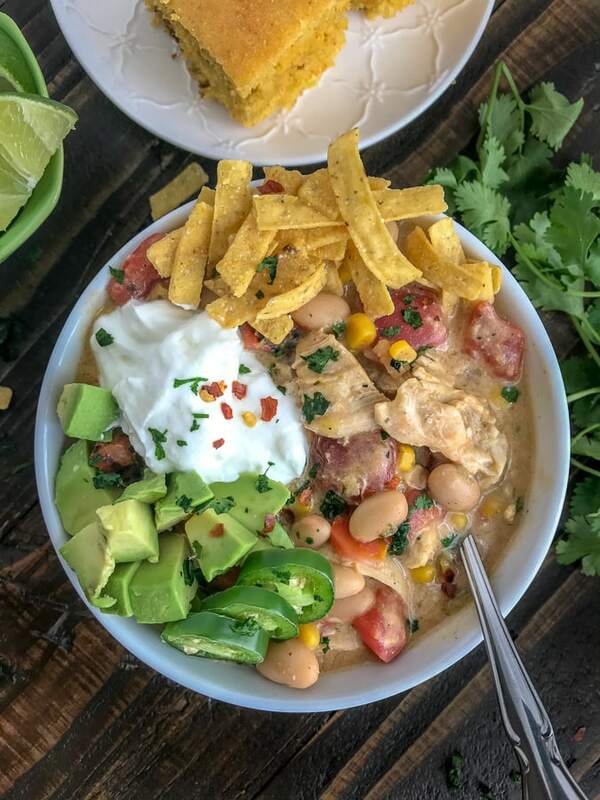 This chili is loaded with chicken breast, white beans, corn, tomatoes, cheese, and lots of wonderful spices! This recipe can be made in under 30 minutes, making it the perfect weeknight dinner option. If you had not guessed yet, my husband and I are major fans of soups and chilis. Any kind really. We find it to be the perfect, hearty dinner option during the fall and winter months, as it is not only made healthy, but helps to warm our chilled souls. Plus, it gives us the excuse to enjoy all the soup toppings: cheese, crackers, crouton’s, jalapeno’s, avocado, etc! 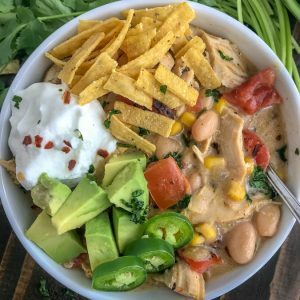 What do you top your soup or chili with?? My husband and I absolutely loved this chili. It has a ton of great flavors, protein, and it only takes 30 minutes or less (from start to finish) to make. 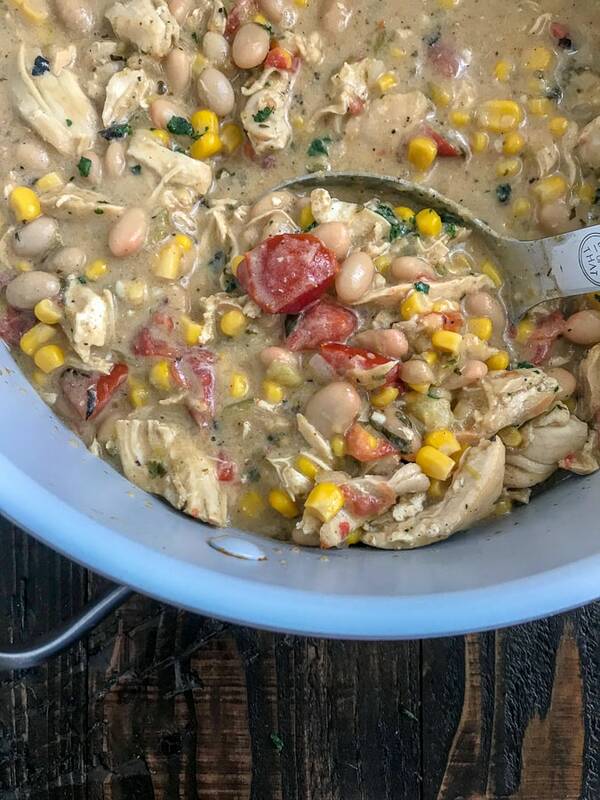 I think what I love most about soup recipes is that it’s one of those meals that you can dump just about anything into a pot and it’s still going to be good! CHICKEN: This recipe calls for a pound of chicken breast. If you’re short on time – swap it for cooked ham or leftover turkey from your holiday feasts, or even rotisserie chicken for an extra boost of flavor! TOMATOES: I tossed in a can of fire roasted tomatoes that I had on hand, but you’re more than welcome to use plain diced tomatoes or any flavor/seasoned diced tomatoes. I thought the fire roasted would add a nice little touch of flavor and I certainly wasn’t disappointed. BEANS: This recipe calls for 2 cans of great northern beans. But you can swap them out for canned kidney beans, pinto beans, or even garbanzo beans. CANNED GOODS: I aim to use either low-sodium or (preferably) no salt added canned goods in order to control the amount of sodium that goes into a dish. So if you do the same with the canned goods, as well as the broth, add salt to taste. If you don’t use no salt added, you may want to skip adding additional sodium – such as what is listed in the ingredients on the recipe. Easy One Pot Lasagna Soup – perfect if you’re a fan of lasagna, but hate all the work of layering noodles and ingredients. Imagine lasagna, but in soup form, and you have the most incredible, creamy soup! This is a subscriber favorite! 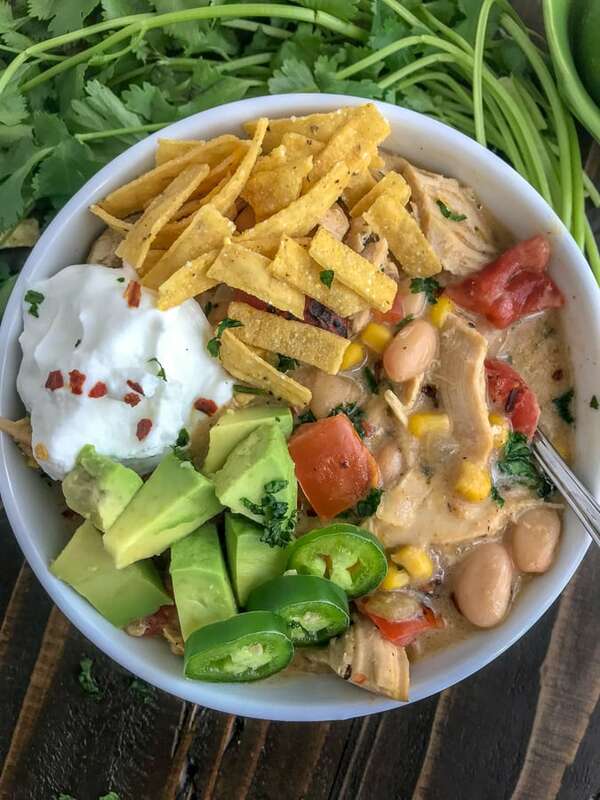 Easy Instant Pot Chicken Taco Soup – very easy to make and quickly done in the Instant Pot. Healthy, hearty and a perfect crowd pleaser for your next football party! One Pan Lemon Garlic Butter Chicken and Potatoes – an easy, one-pan meal that comes together in no time! Pair this with a side salad and watch your family devour this dish. One-Pan Honey Garlic Chicken Thighs and Squash – easy, quick and one pan! My kind of meal. Perfect for those tiresome, busy weeknights where simplicity is vital. 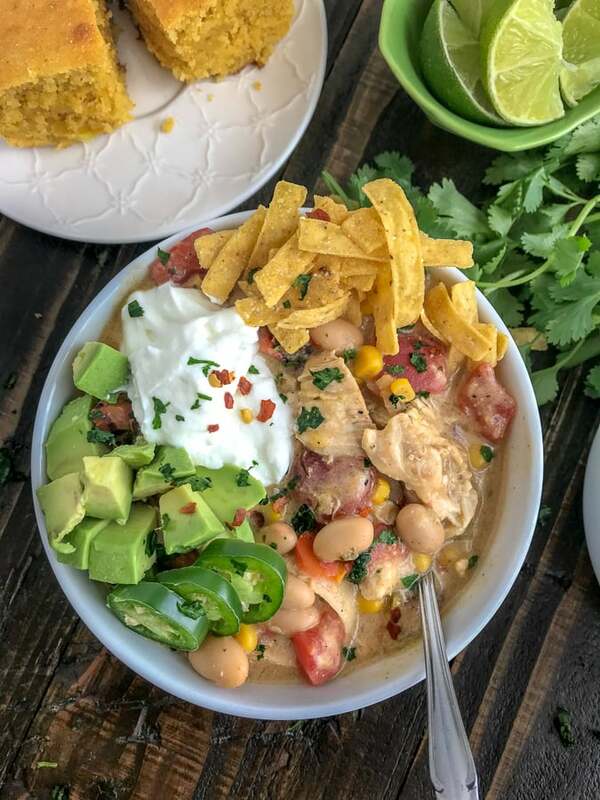 An easy, hearty, one pot chili that is very easy to make, full of flavor and sure to please your family or even a crowd of friends. Creamy with the perfect amount of spice and ingredients. Comes together in 30 minutes or less! Place a large pot over medium heat with olive oil. Once the olive oil has heated, add the chicken breast to cook 4-5 minutes per side. Once chicken has reached an internal temperature of 160 degrees F, remove from pan to a dish to cool slightly and shred (chicken will continue to cook a few minutes when returned to pot). Add the chopped onions to the pot and saute for 3-4 minutes, or until the onions are translucent. Add the minced garlic and cook for 1 minute. Increase the temperature to medium-high and add the chicken broth, cumin, salt, chili powder, cilantro, and pepper. Once it's brought to a boil, add the half & half. Whisk to thoroughly combine. To thicken the broth, combine the cornstarch and water in a small mixing bowl or ramekin. Add it to the broth and whisk until the sauce has thickened. Once the broth has thickened, reduce the heat back to medium. Add in the salsa verde, beans, green chilis, corn, and tomatoes. Mix to thoroughly combine and let simmer for 2-3 minutes. Add in the cream cheese to melt. While you're waiting, take two forks to the chicken and shred (or dice - your preference). Return it to the pot to cook, stirring to combine. 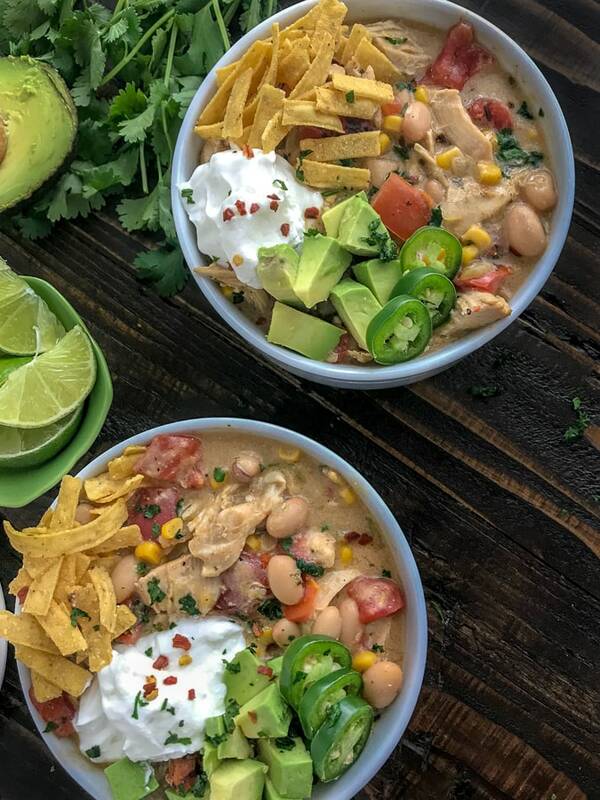 Squeeze in the lime juice and serve garnished with plain greek yogurt, freshly chopped cilantro, jalapeño slices, cheese, tortilla strips, and diced avocados. Half & Half : this is equal parts milk and cream. Cornstarch: the thickness of the broth is to your preference. If you prefer it to be more on the broth side, do 1 tbsp cornstarch with 1 tbsp of water. If you prefer creamy, add 1 additional tbsp of cornstarch and 1 tbsp of water until it reaches the creamy texture desired. Sodium: If you use low-sodium or no salt added broth and canned goods - adjust the salt added to your taste preference. If you don't use low-sodium or no salt added canned goods, you may want to omit the salt listed in the ingredients list. Taste test and adjust as you prefer. 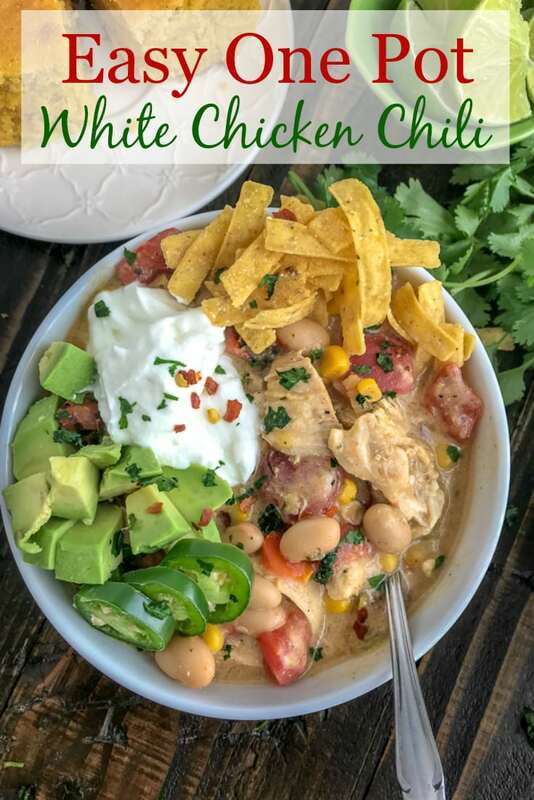 Can i make this in the crockpot?? Absolutely! Just be sure to add the cream cheese prior to it coming out of the crockpot. It needs time to melt, but not curled or affected the recipe in any way!